We all know that cleaning our makeup brushes can seem like a bit of a chore. However there are ways that make it just a bit easier and more time efficient. We all know that you need to clean your foundation and concealer brushes once a week and then your powder brushes every other week. For example the makeup revolution pro cleanse brush tool. It can be purchased at Superdrug for £4.99. Normally cleaning all of my makeup brushes takes me an hour, with the pro cleanse brush tool it takes me just 20 minutes! You put your cleanser onto it and then give your brushes a good old scrub. Another great tool is the real techniques brush cleansing palette. It can be also purchased in Superdrug. It costs £12.99 and comes with a free trial of their brush cleanser. It also works like the pro cleanse brush tool. 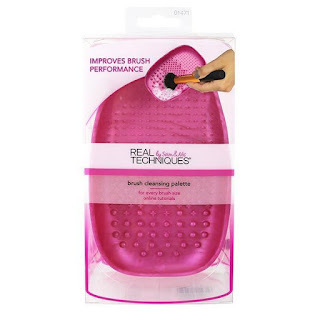 It has four different surfaces to get out all the unwanted germs out of your makeup brushes. I hope this makes it easier for you to all clean you brushes and doesn't make it seem as bad as it feels. Happy cleaning.